Convective Heat and Mass Transfer, Second Edition, is ideal for the graduate level study of convection heat and mass transfer, with coverage of well-established theory and practice as well as trending topics, such as nanoscale heat transfer and CFD. It is appropriate for both Mechanical and Chemical Engineering courses/modules. Thermophysical and Transport Fundamentals. Boundary Layers. External Laminar Flow: Similarity Solutions for Forced Laminar Boundary Layers. Internal Laminar Flow. Integral Methods. Fundamentals of Turbulence and External Turbulent Flow. Internal Turbulent Flow. Effect of Transpiration on Friction, Heat and Mass Transfer. Analogy among Momentum, Heat, and Mass Transfer Processes. Natural Convection. Mixed Convection. Turbulence Transport Models. Flow and Heat Transfer in Miniature Channels. Diffusion and Convective Transport of Particles. Appendix. S. Mostafa Ghiaasiaan is a Professor in the George W. Woodruff School of Mechanical Engineering at Georgia Institute of Technology. After receiving a PhD in Thermal Science from UCLA in 1983, he worked in the aerospace industry for eight years, conducting research and development activity on modeling and simulation of transport processes, multiphase flow, and thermal-hydraulic aspects of nuclear power. He joined the faculty at Georgia Institute of Technology in 1991. Professor Ghiaasiaan has written more than 200 publications on transport phenomena and multiphase flow. He is a Fellow of the American Society of Mechanical Engineers (ASME) and a registered Professional Mechanical Engineer in California. He has been serving as Executive Editor for the journal Annals of Nuclear Energy for Asia, Africa, Australasia and Middle East since 2006. He is also the author of the widely used graduate textbook Two-Phase Flow, Boiling and Condensation in Conventional and Miniature Systems (First Edition, 2008, Second Edition 2016, Cambridge University Press). "It is a well written textbook for graduate students as well as for engineers. Book covers recent topics including flow in microchannels and nanofluids." 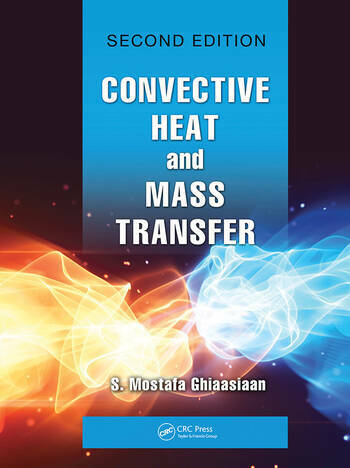 "Convective Heat and Mass Transfer by Ghiaasiaan presents an in-depth yet concise analysis of heat, mass, and momentum transfer fundamentals. The book is a great resource for graduate students and professors in a variety of Engineering disciplines including Mechanical, Chemical, Nuclear, and Biomedical Engineering. A unique feature of this book is Ghiaasiaan’s strong emphasis on teaching mass transfer along with heat transfer in every chapter. Also, the new chapter on diffusion and convective transport of particles (Chapter 14) in the second edition is a great addition unique to this book. I highly recommend the book to all students, professors, and scientists interested in convective heat and mass transfer."